STAMFORD, Conn. (July 22, 2018) – On the heels of an exciting and successful U.S. Youth World’s Team performance at the 2018 Youth Sailing World Championships last week in Corpus Christi, Texas, featuring four gold medals and one silver, another group of 30 talented young sailors in Laser Radials convened on Long Island Sound to compete for the Nancy Leiter Clagett Memorial Trophy at the 2018 U.S. Junior Women’s Singlehanded Championship. 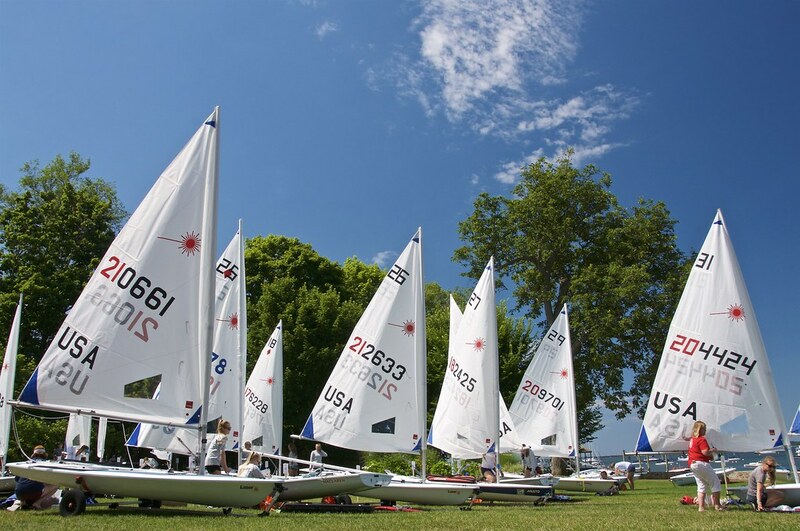 This open US Sailing National Championship was hosted by the Stamford Yacht Club. The fleet of Laser Radials capped a busy final day of racing on Sunday with four more races to determine the 2018 winner and final standings. In the end, it was Elizabeth Shanahan (St. Petersburg, Fla.) holding on to the lead she gained on Saturday to claim this year’s title. Shanahan edged out Grace Austin (Greenwich, Conn.) by just two points, who placed second at the this event for the second consecutive year. Sarah Young (Tiburon, Calif.) enjoyed a strong finish to the Championship and placed third overall. Consistency paid huge dividends for Shanahan who placed in the top five in eight of the 11 races in the Championship. On Sunday she posted a 3-3-5-9 scoring line. Austin made a late surge with a 2-1-(8)-2 scoring line. Despite a slow start to the Championship, Young came on strong Saturday and Sunday. She won three of the final five races, including a 1-2-1-7 scoring line Sunday to finish 16 points behind Shanahan. Young placed 16th in last year’s Championship and ninth in 2016. Shanahan will look ahead to the Laser Radial Youth World Championships in Kiel, Germany later this summer. The weather conditions on Friday, the first day of racing, were sunny with winds from the Southeast at 8-10 knots and relatively calm seas. The sailors completed four races. The fifth race was abandoned due to insufficient winds. Lauren Ehnot (Manasquan, N.J.) won the first two races of the Championship and had a narrow two point lead over Abbie Carlson (Beaux Arts, Wash.), last year’s Champion, at the end of the day and Shanahan was three points back. Carlson won race four and Shanahan earned the win in race three. On Saturday, the weather conditions were the total opposite with winds coming out of the East (close to 90 degrees) at almost 20 knots and because of low tide they were experiencing swells from two to three feet. The sailors completed three races in some very challenging conditions. Shanahan took the lead on Saturday by three points over Ehnot, with more consistent results, and seven over Austin, who won race five to catapult her into contention. The weather Sunday featured winds coming from the south at 12-15 knots (close to 180 degrees), partly cloudy skies, with one foot swells. High-level coaching and skill development is a key component of this championship. Prior to racing, teams took part in a two-day clinic on Wednesday and Thursday led by a collection of top coaches from around the country. The Nancy Leiter Clagett Memorial Trophy is the perpetual trophy presented to the winning sailor. US Sailing Championship medals were awarded to competitors who finish first through fifth. Trophies were awarded to competitors finishing in the top three places. The C. Thomas Clagett Jr. Sportsmanship Prize was awarded to Sarah Grace (Vienna, Va.). The Most Improved Award was awarded to Sophia Debs (West Harrison, N.Y.). For Twitter posts from the racecourse, results and standings, photos, final report, and more information from the 2018 U.S. Junior Women’s Singlehanded Championship, please visit the event website. Take part in the conversation on social media using #Leiter18. The U.S. Junior Women’s Championships Committee annually hosts two events: a Singlehanded and a Doublehanded championship. Both championships are open events. The U.S. Junior Women’s Singlehanded Championship started in 1980.